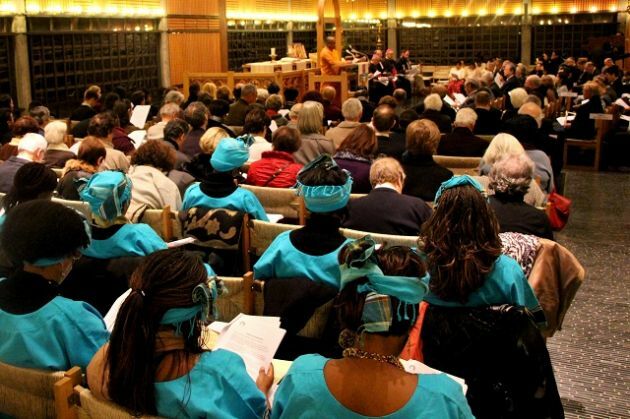 (Photo: Ecumenical News/Peter Kenny)A crowd attends the interreligious service held during the Week of Prayer for Christian Unity at the Ecumenical Center in Geneva on January 21, 2013. Pope Francis has appealed to Christians across the world to pray and to work for full Christian Unity saying that the faithful have a duty to work for it. Linda Bordoni reports for Vatican News that the Pope has reminded the faithful that "Ecumenism is not something optional" during his Jan. 16 weekly General Audience. Francis looked ahead to the Week of Prayer for Christian Unity that takes place from Jan. 18 to 25. For its part, the World Council of Churches said that from Jan. 18-25, Christians will embark on the largest prayer gathering in the world, the Week of Prayer for Christian Unity. "Whether praying together, exchanging preachers or planning ecumenical services, they will bear witness to Jesus's prayer for his disciples that they may be one so that the world may believe," said the WCC. The WCC's members include most Protestant and Eastern Orthodox churches but not the Roman Catholic Church, with which it cooperates on many issues. Pope Francis noted that the annual "Week of Prayer", on the theme "Justice, and only justice, you shall pursue," starts with the celebration of Vespers in the Basilica of St. Paul Outside the Walls on Friday. "Again, this year we are called to pray so that all Christians may once again be a single family, according to God's will 'so that they may all be one'" he said. Pointing out that "ecumenism is not something optional," the Pope e said it aims "to develop a common and consistent witness that promotes true justice and support for the weakest through responses that are concrete, appropriate and effective." The annual "Week of Prayer for Christian Unity" is a time in which Christians are reminded of Jesus' prayer for His disciples that "they may be one so that the world may believe" (John 17.21). The theme in 2019, "Justice, and only justice, you shall pursue ..." is inspired by the Bible's book Deuteronomy 16:18-20. Traditionally the week of prayer's celebration between Jan. 18-25, between the feasts of St. Peter and St. Paul. In the southern hemisphere, where January is a vacation time, churches often find other days to celebrate it, for example around Pentecost, which is also a symbolic date for unity. The text for the prayers for the week is jointly published by the Pontifical Council for Promoting Christian Unity and the WCC, through the WCC's Commission on Faith and Order, which also accompanies the entire production process of the text. World Council of Churches general secretary Rev. Olav Fykse Tveit said that, as people around the world pray together, they will share a sense of joy, concern and accountability, a sharing that forms the heart of the ecumenical movement. "As we celebrate a unity in diversity, we become more able to strongly pursue justice in our many contexts," he said. "In all cultures and continents, we can pray for each other and pray together as a living fellowship for justice and peace."